Football, known by its lovers as ‘the beautiful game’, has been around for more than a century now. Ever since the first ball was kicked, audiences have fallen in love with this quite simple yet beautifully intricate sport. Football’s popularity has meant that it has spread to all corners of the world and lead to many different tournaments. Some of the most popular tournaments include the Premier League in England, La Liga in Spain, Bundesliga in Germany and, of course, the prestigious UEFA Champions League which crowns the best club side in Europe, moreover the world. However, there is no doubt, that the biggest stage in football is the FIFA World Cup. The World Cup has for a very long time served as the ultimate test for the best players and the strongest teams. Simply put, it is the Holy Grail in the football world. The 21st edition of the FIFA World Cup 2018 is going to be held in Russia this year. With less than 2 months remaining till 14th June 2018, the opening day of tournament, excitement has already started to build in fan bases around the world. Keeping this in view, Allsportspk starts a series to acquaint its readers about the World Cup. The fist of such articles focuses on the history of World Cup and how it began. The first FIFA World Cup was held in 1930 from 13th – 30th July due to the efforts of FIFA president Jules Rimet. 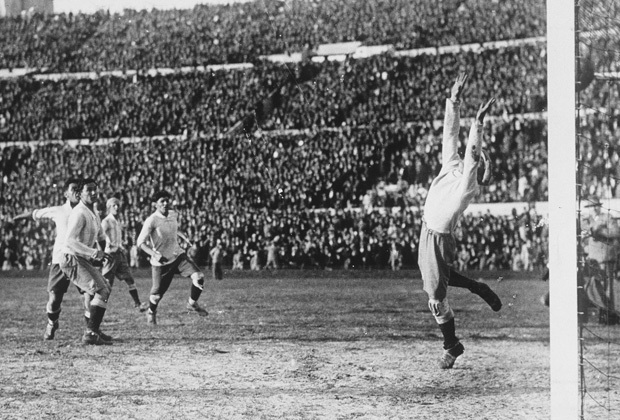 The first World Cup had only 13 teams invited by the football organization which included: Belgium, France, Romania, Yugoslavia, Argentina, USA, France, Paraguay, Mexico, Bolivia, Chile, Peru and Uruguay the host country. The teams were divided into four groups. The accomplished European teams, which did not participate in the first World Cup included England, Italy, Spain, Germany and Holland. This was primarily due to the depression in Europe and the distance from Europe to Uruguay. The hosts Uruguay won the First FIFA World Cup by defeating Argentina 4-2. The 3rd and 4th teams were USA and Yugoslavia respectively. Adidas Golden Boat award was won by Guillermo Stabile. With the passage of time and after continuous changes to the format over the years, the current system of 32 qualifying teams was finally put into practice. The World Cup is now held every 4 years by the country who wins the bidding for the hosting of the event. The last World Cup was held in Brazil from 12 June – 13 July 2014 and Germany won the cup by defeating Argentina 1-0. The qualifying process starts 2 years before the World Cup is hosted and around 200 Countries play against each other. Only the top 32 teams qualify for the finals where they are categorized into groups by the help of Draws. The Italian Vice President of FIFA hid the FIFA Cup under his bed during World War II as he didn’t want the Nazi Troops to steal it. At the 1990 World Cup, each UAE player who scored was gifted a Rolls Royce. Before the 1930 World Cup final, the match referee ordered that a search be carried out on the 60,000 fans present. 1600 revolvers were found from the crowd as a result. Francisco Varallo from Argentina was the longest surviving player who died at the age of 100 on 3oth August 2010. Qatar is spending $220 Billion to host the world Cup in 2022. This is 4 times more than the preceding 5 World Cups combined. A World Cup qualifying match sparked a war between El Salvador and Honduras in 1969. The Football war led to loss of 2000 lives and created 100,000+ refugees. Keep returning to Allsportspk for more coverage of FIFA World Cup 2018 news, information and other intriguing facts!